Comprehensive coverage from the Angus Media team. 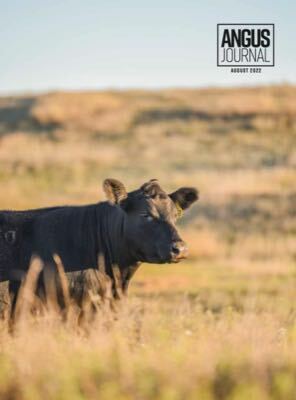 Sustainability has quickly become common in the rancher’s vernacular, but finding a common definition has proved to be a challenge. Addressing sustainability’s risk or opportunity in the livestock industry during Angus University, sponsored by Merck Animal Health, Nov. 4, at Angus Convention in Columbus, Ohio, was Cameron Bruett, corporate affairs and sustainability at JBS USA. Bruett spoke to the challenge of defining sustainability — a simple Internet search yields multiple definitions including environmental and business classifications. When considering business sustainability, Bruett said there's a simple concept —meeting the needs of the present responsibly while giving the next generation the ability to responsibly meet their own needs. Bruett said cattlemen can leverage this issue as an opportunity for the industry as a whole. This great opportunity comes with challenges, Bruett said, addressing some misinformation shared about sustainability and the livestock industry. The 2006 report ‘Livestock's Long Shadow’ described livestock production around the world as being responsible for 18% of all global man-made greenhouse gas emissions. “The same report said this level of greenhouse gas emission responsibility for the livestock sector was more than global transport, more than airplanes, trains, automobiles, golf carts, you name it,” Bruett added. However, the conclusion was wrong. Bruett shared facts from the Environmental Protection Agency (EPA) that refutes the negative narrative. “[The EPA reported] U.S. livestock production is only responsible for 3.4% of greenhouse gas emissions in the United States and transportation's nearly one-third,” he said. Modern beef production really does do more with less. If you compare beef production to what it was 30 years ago, the difference is striking. Why is this information so easily misguided? Bruett suggested it’s because out of the 325 million people living in the United States, less than 1% claim farming as an occupation and 2% live on farms. For today’s farmers and ranchers, transparency is their new reality. “If you can't defend it in public, you shouldn't do it in private,” he said. “So, if you're running a business and your business is to ultimately provide goods to an end consumer and you know your end consumer is asking all of these questions … your response should be ‘I've got to start thinking about how I can answer some of those questions to keep that consumer who's making my livelihood possible happy.’"
To understand the consumer, cattlemen need to know a little bit about the Millennial generation. More than 50% of Millennials try to purchase a product from a company that they like and one that supports the causes they care about. To address the desires of this consumer group, Bruett said the livestock industry has an opportunity to brand itself to show sensitivity toward their wants. “We want to provide new and innovative products that they'll look into,” he said. Bruett said the real sustainability issue, however, is the growing global population and a growth in the middle-income class in countries like China, Africa and South America, and their desire to purchase high-quality animal protein. “There's 7.6 billion people on the planet today,” he explained. “By 2030, that'll be 8.5 million. By 2030, of that growth, 3 billion of those will be people entering the middle class. The articles used within this site represent a mixture of copyrights. If you would like to reprint or repost an article, you must first request permission of Angus Media by contacting the editor at 816-383-5200 or shermel@angus.media. Angus Media claims copyright to this website as presented. We welcome educational venues and cattlemen to link to this site as a service to their audience.